Somewhat out of order, buy hey.. I am posting things a bit out of order, I feel it’s the easiest way for me to get things caught up faster. Still have June and July to catch up with, but not to worry that will show up here shortly. The last part of July was full of fun. A number of our members participated in the TKGA conference in San Diego. I was lucky enough to sort of go along for the ride, my plan was to take the opportunity of being away from home with nothing else to do but knit, I gathered up a few UFO’s with the intention of completing at least one. I did work on one project until I ran out of yarn. Which felt great! One day Suzanne and Charles had a free afternoon and the decision was made to go on a trolley tour of San Diego. I had never done a tour of a city before, my thinking was I don’t want to be a touristy type, but I am very glad I went along. Even though we were at a knitting conference, sometimes it is just nice to spend time with people you like, even without yarn and needles. There was plenty time to find a spot and sit and knit. Some days everyone that attended classes just needed to sit and decompress. Lots and lots of information to absorb. One of the highlights of the experience was the yarn tasting on Friday night. 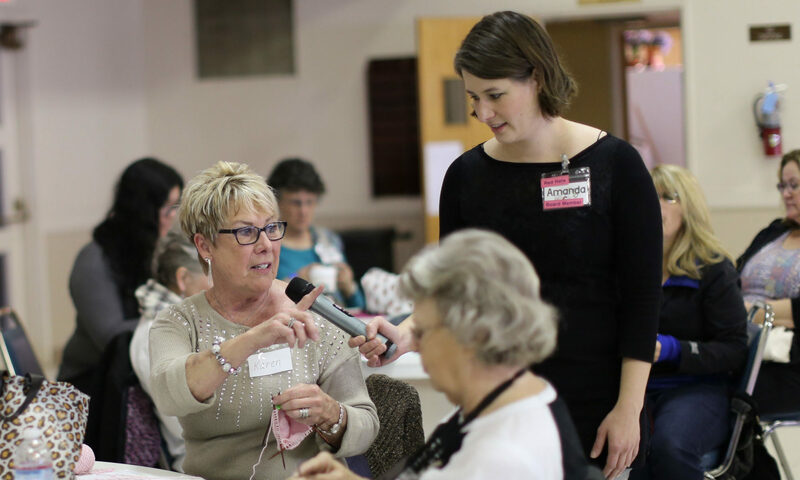 There were 47 different yarns, each attendee received about 15 yards of each yarn. Enough to knit up a swatch, and discover some new favorite yarns. We also all receive two drink tickets…. You can see the evidence on the table. This probably has something to do with how my phone ended up in the toilet that evening… But that’s another story for another time. I am sure everyone learned a lot. I hope the conference will happen out here in the west again in a couple of years. Next year the conference will be held in Charleston, South Carolina. Yesterday was so much fun! I loved seeing all the new faces. 35 people at the meeting, I believe that is a record. Thanks, Cindy. Loved the photos! Ya’ll have so much fun! I’m happy for you all that TKGA had their conference in San Diego this year and so many of you were able to attend.